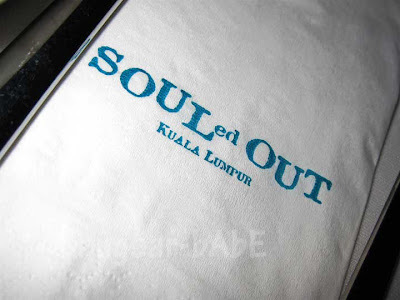 I received an invite from Jek Tan (Director of theQguides) for a food review at SOULed OUT last week. SOULed OUT recently celebrated its 13th anniversary with a new, refreshed menu and I was one of the lucky ones who got to sample the food. Also present at the review were babe_kl and Cap’n HooK, Ruth of The Ruthless Eaters and Rachel of Tham Jiak. 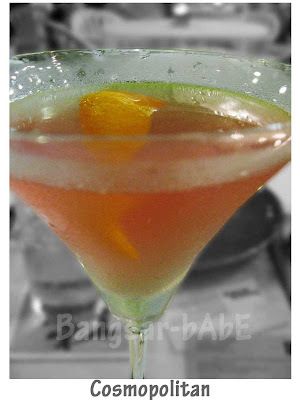 For those who know me, I always order a Cosmopolitan because it’s pretty looking. This version was very nice and alcoholic. The lemon skin garnish gave the cocktail more colour. 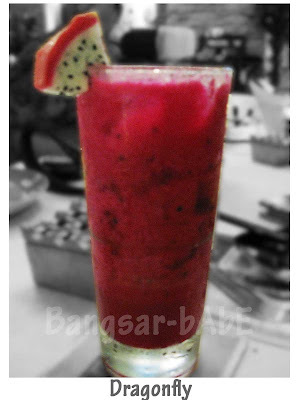 Dragonfly is SOULed OUT’s signature drink made from red dragon fruit, watermelon, strawberry puree, Monin lychee syrup and fresh lemon juice. 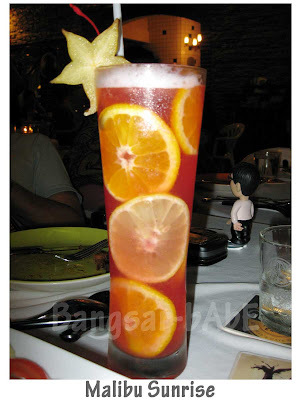 Jek had the Commander in Chief, which was a mixture of vodka, crème de cassis and pineapple juice. 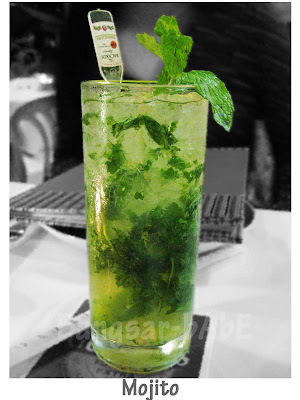 The Mojito (babe_kl’s order) looked really thirst-quenching! First up was the Sizzling Lamb Cutlet (RM28) with naan bread. You can opt to have the lamb with naan, rice or chips. The lamb was meaty, tender and fragrant with spices. The naan was best eaten hot; it was a tad hard when left for too long. 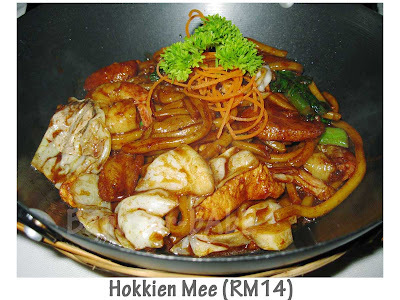 For a halal version, the Hokkien Mee was decent. Of course, I still prefer my noodles to be porky and lardy. 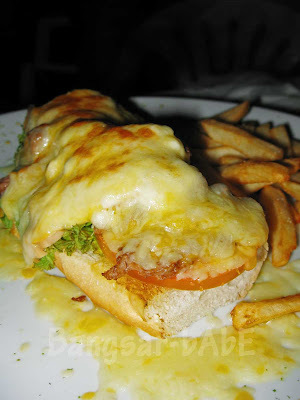 This one came with plenty of chicken slices, prawns and vegetables. The noodles were dark, saucy and tasty with a generous dollop of sambal. 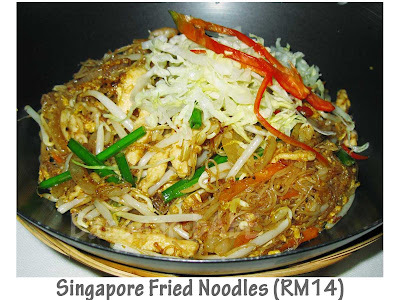 The Singapore Fried Noodles was not bad, and I don’t like mee hoon to begin with. 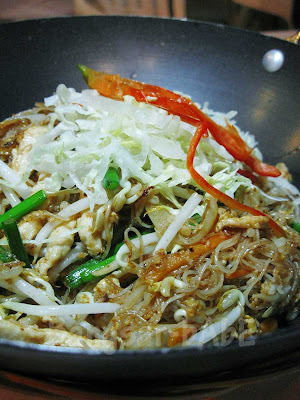 Flavoured with curry powder, the mee hoon had copious amounts of chicken slices, egg, chives and crunchy beansprouts. 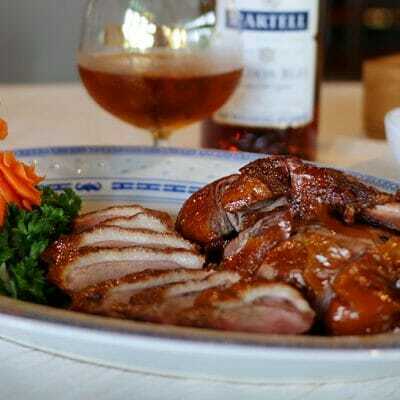 That said, I still don’t get what’s so Singaporean about this dish. It should just be called fried curry mee hoon. 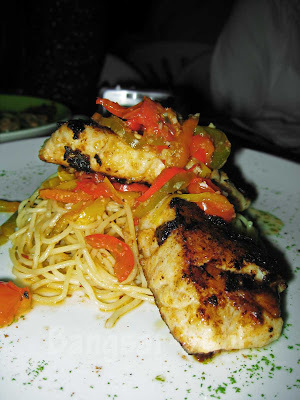 =P The Pan Seared Grouper with Mixed Cajun Pasta is a new addition to the menu. The pasta was cooked just right and the cherry tomatoes and roasted peppers had a rustic, intense flavour. The grouper was well-seasoned and crusty on the outside. Beneath the outer layer was a firm, sweet inside. It’s actually quite good, but since I’m not a fan of fish, it didn’t rock my socks. On the other hand, the roast beef baguette was lip smacking! That’s because I’m a beef lover. Thinly sliced roast beef on a thick, soft baguette and gooey cheese topping, what’s not to like? However, if you can’t take too cheesy food (like Shum & Jeen), stay away from it. I’ll have it all! 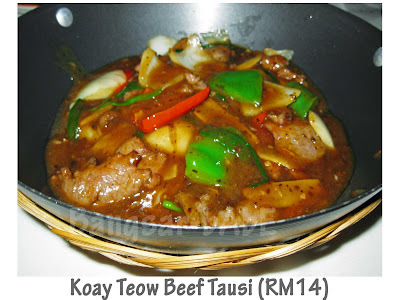 Muahahaha… Another new addition to the menu is the Koay Teow Beef Tausi. Flat rice sheets, beef slices, bellpeppers and onions cooked with tausi (fermented black beans), this was very Chinese, and very nice. It tasted like a cross of wat tan hor (probably why I loved it so much) and beef in black bean sauce. 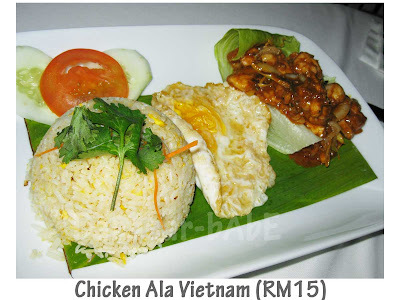 I had two helpings…*gasp* The Chicken Ala Vietnam was just alright for me. 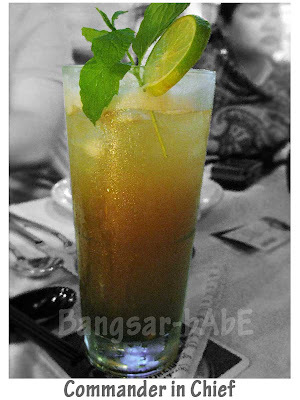 While the chicken cooked with spices (I detected lemongrass) was quite nice, I found the combination too mild. I like my food rich, hearty and fully flavoured. Served piping hot, the aromatic Claypot Loh Shi Fun is another old favourite. 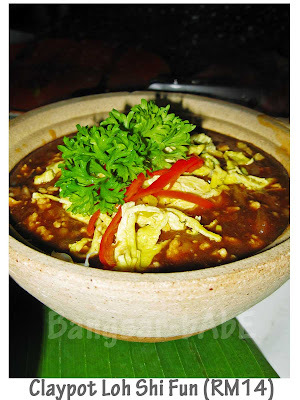 Topped with shredded egg, the thick gravy was full of savoury minced chicken and sliced mushrooms. This would make a good comfort dish on rainy days. 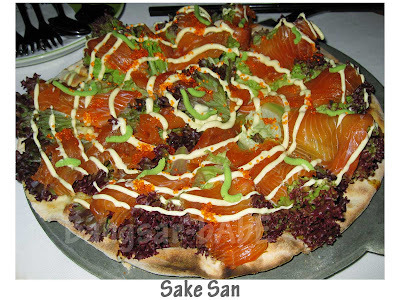 The Sake San (Salmon Pizza) is a thin-crust pizza topped with salmon slivers, ebiko (fish roe), wasabi, mayonnaise and lolorosso. I liked how the mild wasabi and mayonnaise complemented the salmon slivers. Each individual fish roe “pops” in the mouth, releasing a hint of salty, slightly fishy flavour. The lolorosso added a refreshing and crunchy twist to the pizza topping. I enjoyed this very much. 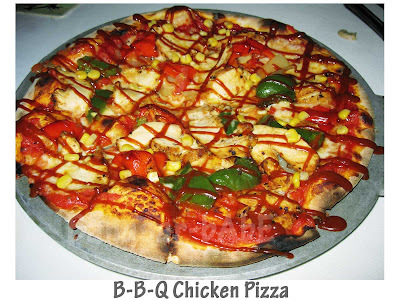 I didn’t quite like the B-B-Q Chicken pizza. The BBQ sauce overpowered the rest of the toppings, so that was all I could taste. The whole sauce-topped combination was too heavy. 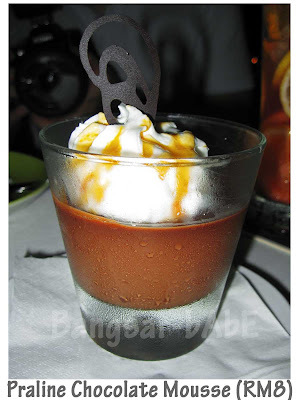 The Praline Chocolate Mousse was rich and dense, maybe a little too rich after our rather heavy meal. But if you had a light meal, this would be good. 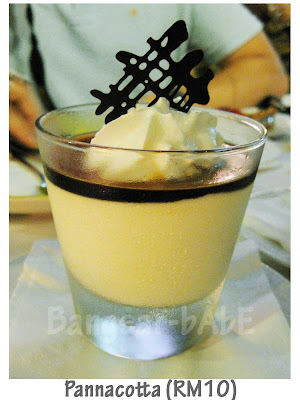 I tried a bit of Pannacotta with caramel, and found the texture light and silky. It wasn’t overly sweet – ideal for those who can’t take too sweet desserts. Between the two, I prefer the Chocolate Mousse. What stole the spotlight was the Lava Cake. Topped with Haagen-Dazs ice cream, the cake was warm, dense and moist. As stuffed as I was, it was too good to resist! 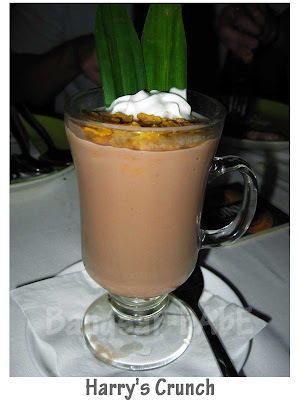 The Harry’s Crunch (served hot) is an award winning warm combination of vodka, Bailey’s Crème de Cacao, chocolate sauce, pandan syrup, topped with crunchy cornflakes. Oh-my-goodness this was heavenly!! And loaded with Bailey’s. 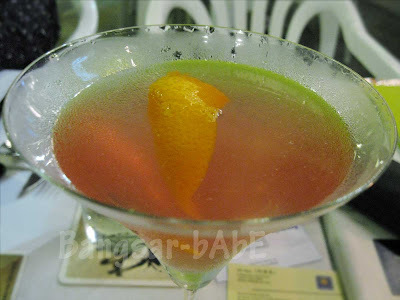 I enjoyed the dinner, especially my two very alcoholic drinks, Koay Teow Beef Tausi and Lava Cake. Thank you Jek, for inviting me, and Fanny, for your incredible hospitality. 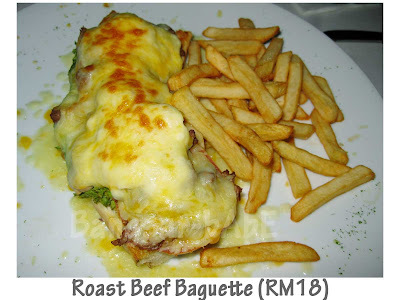 *SOULed OUT is running a Sir Lunch-a-lot Set promotion (Mondays – Fridays from 12-3pm) until 31st May 2009. It Aint Western cost RM15++ while It Aint Eastern is RM18++. All sets come with a juice, main course and coffee/tea. Verdict: A great hangout place with good booze and hearty fares. Wow…i cannot even remember when was the last time i visited this place. 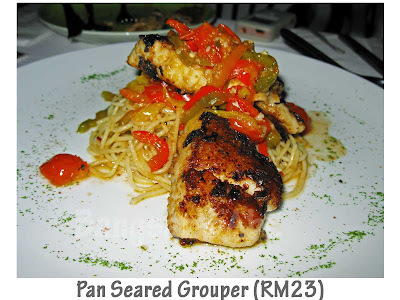 whoa..new menu again..they r alws chg’ing and their food r quite good mostly.. 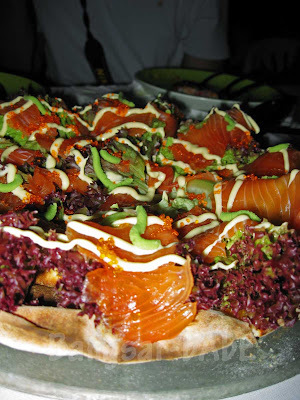 The salmon pizza is nice, one of my favourites….. I personally detest Souled Out nowadays. They’ve become too noisy and rowdy( esp. at the ground floor), and I’m not talking about the ambience, but rather the staff who like to yell and ring bells. As for their food, they should concentrate on mantaining the quality of their ‘classic’ stuff, like the northern indian menu and local menu (which used to be quite good plus value for money), instead of introducing new stuff which looks and taste mediocre, at best. OMG – that’s a LOT of food you had, lol! 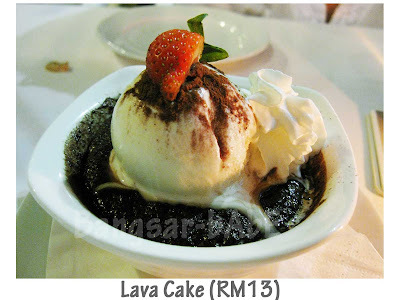 I go to SO pretty regularly – the Lava Cake is a firm favourite. 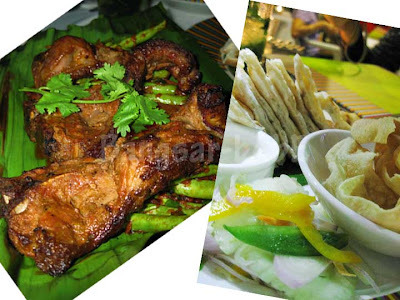 The new item Sizzling Lamb will be a sure-try in my next visit there! 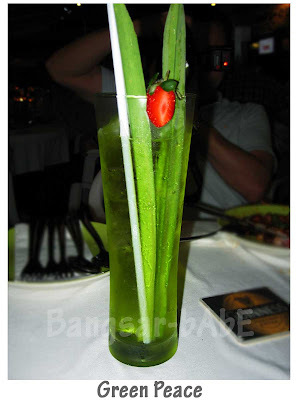 taufulou – The drinks are very pretty looking! DF – I was there on a weeknight, so I didn’t find it that noisy. Then again, I wouldn’t know how rowdy they can get since I’m always seated upstairs when I go there on my own. It’s less noisy inside. The northern Indian selection is still available, but as far as taste is concerned, I can’t tell whether it used to be better. I always have their nachos, pizza and lamb shank. There’s little to not like about Souled Out, prices are reasonable and that Sake San pizza is a timeless classic!! Not sure about the new stuff though.. none of them look particularly enticing, will stick to the pizza and lotsa cocktails! Whee!! yeah this shud b strictly for wkday dining..then again hartamas has died down alot.. havent been there in yonks..but do remember some of their classics..their butter chicken was damn good! Btw, I added you in my fav link. Exchange link? i was over at Hartamas a few times, but KL friend mentioned that Souled Out’s food so-so only, good for a drink, not a meal. but i might change my mind. J2Kfm – Thanks! The food is not fantastic, it’s decent and hearty. mimi – Hmmmm…maybe you should email them and tell them where they can improve. leo – I think a lot of people haven’t gone to SOULed OUT for a while…too many hangout places de! I also haven’t been back for ages. But the Sake San pizza is still one of my faves there.. Along with the drinks drinks drinks.. Did I mention drinks? LOL!! It has been an insane week..
lecoupletoy – Hahaha…3 times mentioned. But I thought you went for drinks on Monday de?? Glad you all had fun. Looking forward to seeing you soon for more food events!